Yay! We are so proud of you. Congrats on a phenomenal race. Wow! Am completely in awe. Congratulations! Thanks Claire! So great to hear from you. I hope all is well. Please keep following the blog. I know I can run even faster! Way to go Cuz! What an amazing achievement logging your 1st 100 on your 1st attempt over such a wicked sloppy trail. Pseudo live results (several hours delayed) can be viewed at http://www.ultralive.net/rr100/webcast.php. Click on the Top Men link. 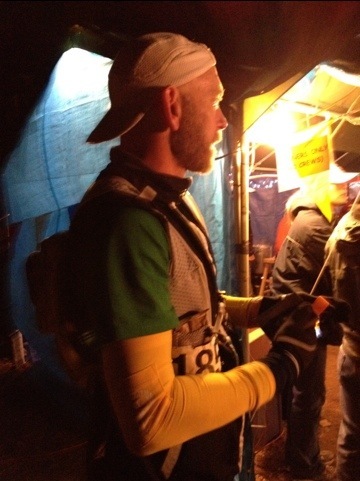 As of this post, Mike is shown in 32nd place overall at the 80 mile mark. AMAZING!!!! !.MICHAEL CONGRATULATION TO YOU FOR BIG ACCOMPLISHMENT,AND SIGNIFICANT OTHER FOR SUPPORT AND KEEPING US POSTED SO WE CAN BE WIHT YOU WHLE YOU WERE RUNING. Thanks Maria for all your love and support! You were all a very big part of this accomplishment! What an amazing accomplishment and what an inspiration! congratulations! Thomas, thanks so much for the comment! Once I recover I will continue to post about my training and anything else people want me to cover. Have a great week and thanks! Congratulations Mike. Sorry, I couldn’t make it..moving weekend. That is awesome….very happy for you. Go enjoy some Salt Lick BBQ in Austin. Aloha Dave! Thanks! We took your advice and did the all u can eat family lunch at the Salt Lick. Wicked awesome!! Hope we can hang out soon. Maybe I can get you out to Cali sometime for one of these races. Enjoy the new job! DOC! So proud of you, great job! Hungus, what can I say? Great to hear you on my iPod!!! I started doing crossfit just so I could be a stud like you. Hope all is well and big thanks!!!! Great job Garrison!! what a wicked fast time for your first ever 100miler with not ideal conditions as well! You are the man! we are proud of you!! Doug thank you so very much to you and your family!!! Not only did you put us up and do the contrast tubs with me. You also were with me every step of the way. I knew I could count on Pauline reading a new comment from you every time I saw her. The recordings were awesome as well. Thanks for posting the blog link to your Facebook as well. Great to connect with old friends and make some new ones along the way. Hope we can hang out again soon!! Give everyone a hug and kiss from P and I. By the way…you were right, Gabor was there with me every step and he would be pretty stoked about the whole thing. Thanks Erik. So stoked that we will get to hang out in April. 50k will feel so short! Fruit Pie! Thanks Katherine! I’m sure we will b able to hang out soon!! Results have been updated. Doc G officially in at 21:18:42 for 36th (Overall), 33rd (Men) out of 138 finishers as of 9:15am. 406 registered for the 100m. No information on how many actually started. Top 8% of the registered field. You have accomplished something very few people will ever do! What an incredible feat! I have such respect for you! I hope by the time you read this you’re on your way to a big, juicy burger and a cold beer! Cheers! Aloha Roodi. I have had my share of BBQ and maybe 1or 2 beers since the finish. Going to enjoy the next few days of no training before i start to train for the next one. Thanks for the great message on my iPod! Nice work, man. You are nuts. Of course, you have always been nuts. Very impressed. Thanks Keith! I need to get you out to one of these races sometime. You would have a blast. Hopefully I get into Western States next year and you can come along and pace me for a few miles!